How can I clean my home without chemicals? One of the safest and best ways to disinfect and clean a home is with heat. This can easily be accomplished with a good quality Steam Cleaner. Not to be confused with carpet (steam) extractors, these machines emit steam (vapour) through a variety of attachments to clean most areas of a home. 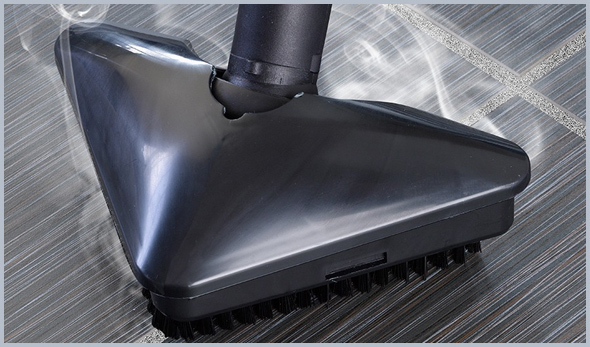 By cleaning with steam, the machine sanitizes and loosens soil avoiding the need for harsh chemicals that leave harmful residue. Are the steam cleaners good for hardwood? No. They are not recommended by us for use on hardwood or laminate. This is because the steam is forced down and overtime it will penetrate any seams or scratches that aren’t protected by the floor finish. As a result, the floor boards will cup (warp) as moisture is continually forced in the cracks. We only suggest using them on regular floors such as stone, vinyl and linoleum. The best way to clean hardwood is with the Bona hardwood floor care system. In order to maintain hardwood a neutral cleaning solution is important to prevent streaking. Bona products are also safe for people and pets because they use a high quality micro fibre mop system that cleans so well there isn’t a chemical residue left behind. For dull and damaged hardwood Bona has a product called Hardwood Floor Refresher that helps bring back the shine. Bona’s Hardwood Refresher is the only product on the market that urethane can be used with afterward. What is good for cleaning ceramic tile / grout? Tile is easy enough to clean; the challenge is usually the grout. The best way to clean grout is by scrubbing deep down. Our line of hard surface cleaners are designed to scrub grout to help bring back the loss of colour that happens in high traffic areas. Another way is to clean with steam. Steam cleaning grout helps dissolve the embedded dirt without the use of harsh chemicals. The microfiber pad then pulls away the dirt and grime that the steam loosened.